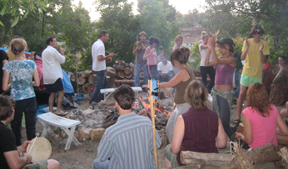 All Nations Lodge Lodge is based on native and ancient teachings from all lands, cultures, tribes and nations with an emphasis on the Mayan Cosmology and earth shift prophesies. We are no longer holding PUBLIC SWEAT LODGES in Thousand Oaks, but are continuing to offer PRIVATE LODGES for friends of All Nations Lodge. If you consider yourself a friend and would like to attend or find out about other local sweat lodges, contact Patrick at 805 469 9847. 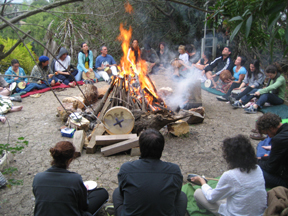 You can also join our meetup group at this link: http://www.meetup.com/Sweat-Lodge-Shamanic-Studies-Los-Angeles-Ventura. sandals, and loose fitting cotton clothing to change into for the sweat lodge. Join us for the fun, chanting and sacred purification with Patrick Harbula (Ninaa Makoyi–Man Wolf ), author of The Magic of the Soul. 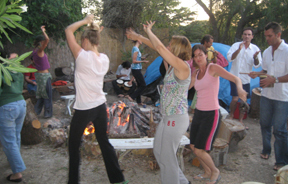 WE DO OCCASIONALLY OFFER SWEAT LODGES AT OTHER LOCATIONS AS PART OF VARIOUS CEREMONIES AND RETREATS. IF YOU HAVE ANY MEDICAL CONDITIONS–ESPECIALLY HIGH BLOOD PRESSURE OR HEART CONDITIONS–YOU SHOULD CONSULT YOUR DOCTOR BEFORE PARTICIPATING IN SWEAT LODGES. PREPARATION: Eat light before the ceremony and hydrate yourself well all day. Not too much water the hour before going into the lodge, so your bladder is not too full. 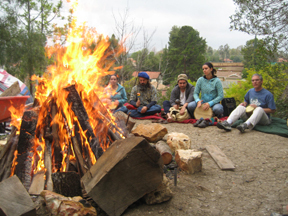 Bring two towels and loose fitting cotton clothing (shorts & t-shirt are ideal) to change into for the sweat lodge, or wear them here and bring clothes to change into after the lodge. You will be soaked. Sandals are helpful as well. Bring plenty of bottled water for during and after the ceremony. CANCELLATIONS: From now on we must insist that if you are going to cancel, that you do so by Friday noon the day before the lodge–really the earlier the better–so we have time to clear your spot for others on the waiting list. We are keeping track of those who cancel at the last minute and/or don’t show up. We understand emergencies come up, but if we don’t receive a cancellation with adequate time without a really good reason, you wont be invited to attend in the future. If it happens twice then you will for sure not be invited back. I hope you understand we are setting this boundary in order to provide the best experience possible for our sweat lodge community. important part of the ceremony is the interaction and synergy that takes place through all of us sharing and supporting each others intentions for the lodge. t and observe the same guidelines above for Cancellations if your plans change and you will not be attending if a spot does open up. And please check the status of your reservation on Saturday to see if a spot has opened up, because we will be expecting you if it does. PARKING: If you wouldn’t mind, please park down the street a bit from our place (or really the farther away the better). And please not in front of the place to our left (facing our house that is). Our neighbors are not happy when there are a lot of cars parked in the cul-de-sac, and we want to keep the peace. If you get here on the early side and want to park in our driveway (if there is space), feel free. MEDICINE GIFT: We can always use rocks to heat the lodge, so as a medicine gift, instead of sage, which we have plenty of, or tobacco as gifts, please bring a nice rock with you, a gift that will contribute to the ceremony in a very meaningful way and continue to contribute in future lodges even if you aren’t there. If you choose to do so, it must have a bit of a rough surface (definitely not smooth like a river rock) and ideally be about the size of a medium-sized cantaloupe. This is not at all a requirement just preference. We still love sage too. For information on LPI events, please visit calendar.